Director Yorgos Lanthimos brings his idiosyncratic flourishes to the period drama. 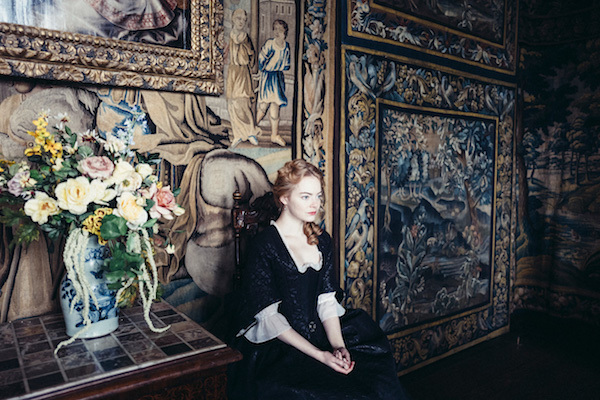 Slathered in lavish interior, adorned in opulent garb, and streaked with excessive amounts of make up, The Favourite demands to be seen on the big screen. Early 18th century. England is at war with the French. Nevertheless, duck racing and pineapple eating are thriving. A frail Queen Anne (Olivia Colman) occupies the throne and her close friend Lady Sarah Churchill (Rachel Weisz) governs the country in her stead while tending to Anne's ill health and mercurial temper. When a new servant Abigail Masham (Emma Stone) arrives, her charm endears her to Sarah. Sarah takes Abigail under her wing, and Abigail sees a chance at a return to her aristocratic roots. Their burgeoning friendship gives her a chance to fulfill her ambitions and she will not let woman, man, politics or rabbit stand in her way. The most surprising (and delightful) part about The Favourite is how sharp, biting and infinitely quotable the dialogue is. It is, almost at once, writing that leaps right off the screen and slaps you in the face, and it also happens to be, without question, one of the best screenplays of the year. Even more surprising, it was penned by relative nobodies, Deborah Davis (a producer whose only writing credit is The Favourite) and Tony McNamara (writer and director of Ashby and The Rage in Placid Lake), both of which display the masterful chops of a refined screenwriter. The story’s central power struggle is a twisted chess game that, in addition to be wickedly funny, has something to say about the nature of love and affection, the austerity and the oddity of it, as well as the limits of control and what our desire drives us to do. Broken into 7 sections, its narrative scope is as sweeping as its many wide angle shots, and it maintains its boisterous energy for the entirety of its two hours, only encroaching on repetitiveness and tedium during its slightly bloated third act, as it builds to a conclusion that doesn’t instantly satisfy but makes logical sense when you really stop to think about it. The razor-sharp wit of the writing is brought into joyous reality in the incredible performances of its leads, all of which shine so brightly that it’s extremely difficult to give any one the edge over the others. Olivia Coleman is gloriously batty and unhinged, and delivers comedic perfection as Queen Anne. Both Rachel Weisz and Emma Stone give career-best performances that show their skillful versatility; they do the complexity of their characters great justice. All three actresses give Oscar-caliber performances, and it’d be a shame if they don’t all at least get a nomination for their work here. Nicholas Hoult also gives solid support to the picture, but is so eclipsed by the leads that, sadly, no one may be buzzing about him. Completing the whole experience is Yorgos Lanthimos’ fantastic eye and top notch direction, full of camera movement and wide and fish eye lenses, Robbie Ryan’s lush cinematography, and the exquisite art direction from Fiona Crombie, Caroline Barclay and Dominic Roberts, which should sweep the set and costume design come Oscar time. In many respects, The Favourite is a companion piece to Kubrick’s Barry Lyndon, only where Kubrick went to great lengths to bring the period accurately to life, Lanthimos takes care to highlight the absurdity (a perfect example being a ballroom dance scene) and exaggerate everything. The way he attempts to depict the era is one we haven’t seen before, so it can be jarring at first, with all its wide angles and fish eye lenses, but it serves to emphasize the extravagance of the period, wringing every conceivable inch out of the setting and squeezing style out of every composition. His direction is deft, full of spritely movement, and very exciting to behold. 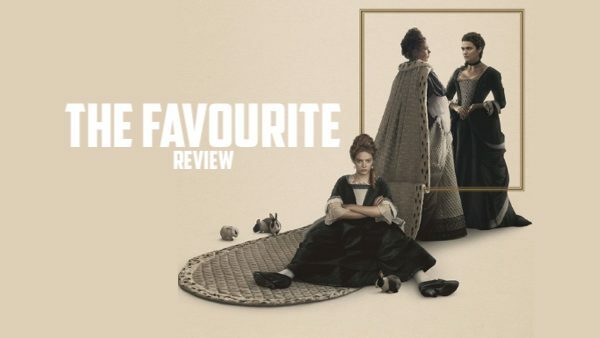 All things considered, The Favourite is very nearly the complete package. Its twisted antics run a bit long and encroach on repetitiveness, but the experience prevails. Lanthimos has finally crafted something that landed with me personally, which is something I’ve been aching for since I disappointedly left The Lobster. I suspect this has everything to do with the outsourcing of the script, which I hope he continues to do, as it would seem that his eye is infinitely stronger than his abilities as a screenwriter. Nonetheless, there’s a lot to love about this film that’s so cleverly executed, morally loose, and exuberantly full of pet rabbits, duck racing, and breathtaking sets/costumes. It’s everything one would hope out of a 18th century period piece and some. Recommendation: Fans of period drama, darkly twisted comedy, and Lanthimos’ idiosyncratic style will be right at home here. Rating: 4.5 rabbits outta 5. What did you think? Share your thoughts and feelings in the comments section below, and as always, remember to viddy well!